Sarah’s medical conditions forced her to give up work. Now she is a disability activist and a champion for people with housing needs in Greater Manchester. 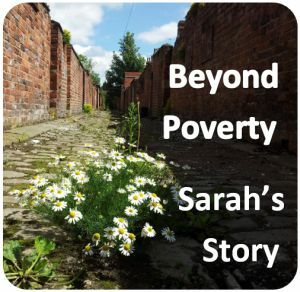 Sarah grew up in South Manchester, her mother was abusive and had mental health problems. “She would batter us, beat the devil out of us. Nobody tapped me on the shoulder, and said ‘it’s not you kid, it’s her’. My dad was a battered husband for 20 years. He was hospitalised one time. Once, my mum locked him in the cellar for a week, didn’t give him food, all he had was water. Dad worked in hospitality, Mum didn’t work, so we didn’t have much money. We weren’t starving poor, but only because Dad always used to divert the delivery van on the way to the restaurant – things would go missing on the way”, Sarah laughs. “But it was the 70s. Everybody was dirt poor. So you couldn’t really tell. “When I turned 16, and I knew I was not legally required to live there anymore and be a punchbag. I packed my bag with my O-level books, and out I went, followed by my sister. We were homeless for a few months. First we spent a few nights in a greenhouse shed, in someone’s back garden, of a house that was empty. “Then we headed to Hulme, and told the Council, “we’ll take anything you’ve got”. Before that came through, we lived in the old Crescent squats. It was a hard, tough, awful, derelict place. And dangerous. There was a dark side to the Hulme Crescent squats because you were living outside the law, outside the rules, outside of protection. You took your chances. The squats were basically run by the gangs. They were the enforcers. There were murders. The police stopped policing it, it was a no-go zone. For squats in general, you might not pay rent, but it extracts a price. It takes something from your head. The lack of security. Being seen as beyond respectable, worthy society. The way people look at homeless people, with disdain. “We were there for several months before we got a council flat, just up the road. It had dust falling from the ceiling, rotting walls, and holes in the windows. The heating didn’t work, and there was mould everywhere – it was just as bad as the squats. But it was a start. And we were so poor we just lived on tins of spaghetti hoops. “After a few months, my sister got pregnant and moved to north Manchester with her boyfriend. When she had her baby, I promised him that he would not suffer like we did, and he would have a better life. But I felt trapped, and I thought, “how am I going to do this?” At the age of 20 I stood on the balcony of my flat. I thought, I could jump, or I could fill out the PCAS form for polytechnic. I filled it in and applied for a degree in London, never in a million years expecting to be offered a place. And I got a letter back offering me a place to study Media and Cultural Studies, at what later became Westminster University. But then, about 8 years ago, Sarah started to become ill, bed-bound with severe pain and reduced mobility. After several years of tests Sarah was diagnosed with Hashimoto disease. “The insurance that I had through my trade union saved me from real poverty”, she says. “It paid me the equivalent of benefits while the medical tests were ongoing. After my diagnosis, and given how seriously my condition had deteriorated, I was moved onto Personal Independence Payments. Sarah asked us to keep her identity private, so this has been written under a different name.